JVC Professional Products Company, a division of JVC Americas Corp., revealed that North Shore-LIJ Health System, one of the largest nonprofit, secular hospital systems in the country, recently purchased three GY-HM650 ProHD cameras to upgrade its HD production efforts. Video producer Robert Hoell shows off one of the new JVC GY-HM650 ProHD cameras that are being used by North Shore-LIJ Health System for a variety of video projects. Since the hospital system purchased its cameras in late May, its three-man media production team has been shooting HD footage for a variety of projects, from promotional videos on location to surgical procedures in the operating room. Albert Ritondo, North Shore-LIJ assistant director for media productions, said the video team is often asked to be in the OR to document new procedures or provide footage for network television stations. As part of the public relations department, they also provide coverage of press conferences to share with local stations – and coverage has improved with the new JVC cameras. The GY-HM650s are also being used extensively for a new 13-week series, Focus on Health, which will debut regionally on Cablevision and Verizon FiOS in November. According to Ritondo, the new series is replacing Medical Update, a basic multi-camera studio interview show. Focus on Health primarily features packages shot in the field. JVC’s .MP4 native file recording means no transcoding is required for editing on North Shore-LIJ’s Sony Vegas NLE systems. Ritondo said the non-proprietary SDHC cards used to record footage on the GY-HM650 are not only convenient, but they are affordable enough that North Shore-LIJ uses them for archive. With 16 hospitals across New York City, including five tertiary hospital complexes, North Shore-LIJ is one of New York’s largest employers. 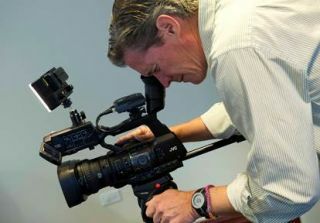 Its media productions team has been shooting in HD since 2005, purchased the new JVC ProHD cameras to replace its aging Sony HVR-Z7U HDV camcorders as part of a transition to a completely tapeless workflow.